While I did work out at 6, I didn’t feel warmed up enough to complete jerks. I’ll attempt to do so tomorrow or Monday. I did, however, complete the metcon. 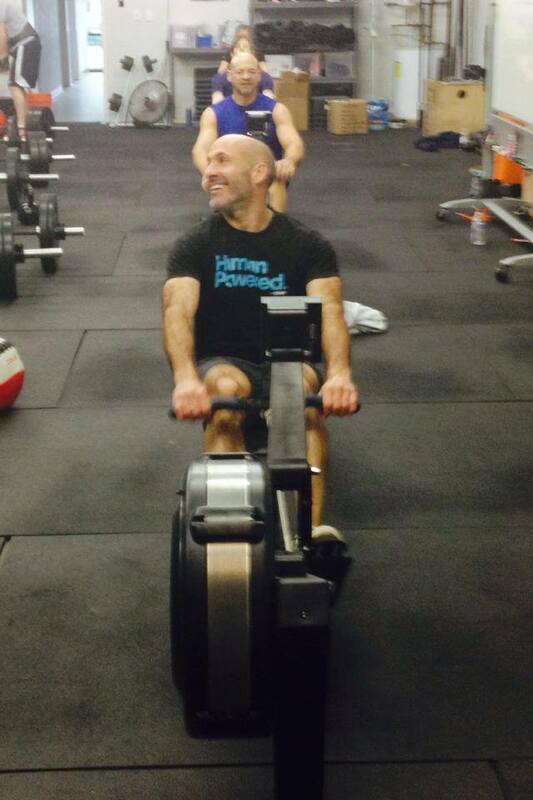 * If you cash in with rowing, cash out with double unders and vice versa. ** Prescribed weights listed below. *** You may choose to complete any type of squat, e.g., front, high bar back, overhead. My only goal was to not have to drop the bar during any of the activities. As the rowers had been claimed, I began with double unders. Things didn’t start off well, as I missed the 14th and 24th reps. I did, however, complete the last 76 reps unbroken, and finished double unders at the same time many had finished the 250m row. Behind the neck push presses are ghastly. Lateral bar hops were a welcome relief. Sumo dead-lift high pulls presented the least challenge. Good. I completed high bar back squats and, surprisingly, front lunges with the bar in front rack position. My right wrist is feeling much better. Yay! Lunges were painfully miserable. I managed to not have to drop the bar. Lateral bar hops continued to be a welcome relief throughout the workout. Rowing 250m felt exceedingly easy compared to the work that I had completed. Jeff was kind enough to coach the 8:30 workout this morning so that I could, well, work out. Only 1 non-rowing teammate may work at a time, and may complete a maximum of 10 reps.
Rowing teammate may row a maximum of 50 calories at any one time. Activities may only be completed as teammate rows. Teammates must rotate through rowing in the same order throughout workout. At any time, rowing teammate may call “Switch!”, indicating that next teammate in order may begin rowing. I asked, “Are there any folks who wouldn’t mind being in a team of 3?” Both Angelina and Deborah said they wouldn’t mind. I said, “Good, that means you’re on my team.” Ha! My one and only goal was to not be a d!ck, as I often push teammates too hard. I wasn’t a d!ck today. I’m as surprised as all of you. We rowed in alphabetical order, and usually completed 10 reps of any activity at a time. I completed 10 unbroken reps of all activities, and kept rowing strokes per minute to an average of 24. Toes to bar was the easiest activity, and rowing was the most difficult if for no other reason than there was no rest. Dead-lifts at 150# were certainly manageable. Angelina, Deborah, and I worked very well together, and we evenly divided the work and worked at about the same pace. We also took an early lead and then kept that lead, completing more rounds than the teams of 4. I credit Angelina and Deborah. We completed 39 dead-lifts of the 5th round. As each round was worth 200 pts, we scored 989 + 471 calories for a total of 1460. Thanks for teaming with me, Angelina and Deborah! The time flew by, and I had a tremendous amount of fun. ‹ PreviousI’m a lover not a fighter.